Jamborite: Mineral information, data and localities. Named in 1973 by Noris Morandi and Giorgio Dalrio in honor of John Leslie Jambor [1936 - January 18, 2008 Vancouver, British Columbia, Canada], Canadian mineralogist, Geological Survey of Canada, Ottawa and CANMET, Ottawa, (1960-1993), Professor of Mineralogy (1994-2000), University of Waterloo, Waterloo, Ontario, and co-editor of the Canadian Mineralogist (1975-1977). 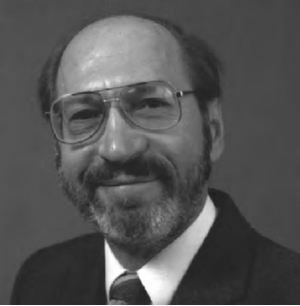 Jambor is one of the most prolific investigators of Canadian type minerals, who described or participated in the description of 31 new species. As part of the recent re-evaluation of the nomenclature of the hydrotalcite supergroup (Mills et al., 2012), jamborite was identified as a questionable species which needs further investigation. Subsequently it was redefined in 2014 as a valid species (IMA 14-E). Jamborite lies outside the hydrotalcite supergroup as defined by Mills et al. (2012). 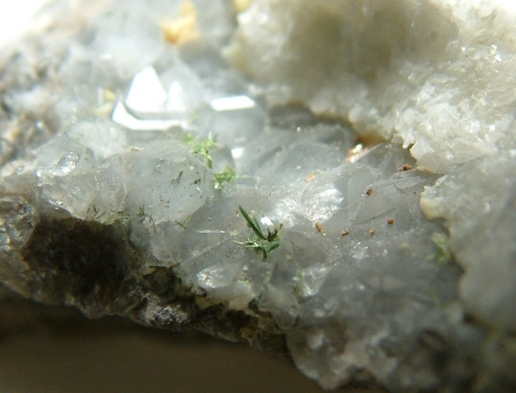 Jamborite is a redefined mineral species, and what has been refered to as jamborite in the litterature pre-2015 may not longer fit into the redefinition. Andrew G. Christy comments on this at the messageboard [See: http://www.mindat.org/forum.php?read,6,55404,393341#msg-393341] : "1. 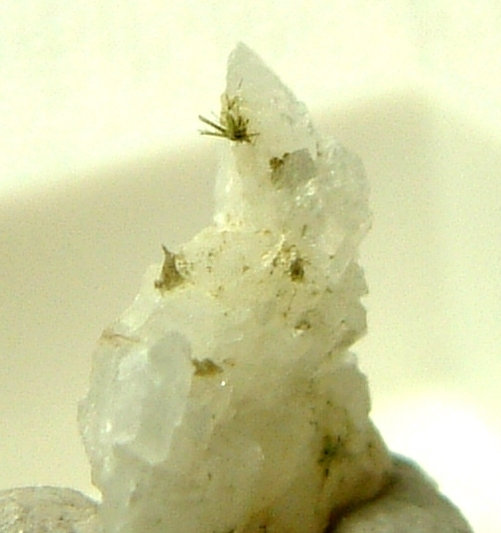 Jamborite is a valid mineral species, but rather different from the original description. It is a basic sulfate with a layered structure that is not quite a member of the hydrotalcite supergroup, but bears close resemblances to those minerals and also to mooreite, etc. There is no sulfide in it, but in addition to Ni2+, there is a small amount of a trivalent cation which appears to be Co3+; the need for relatively high Co and low Fe probably explains the rarity of the species. 2. 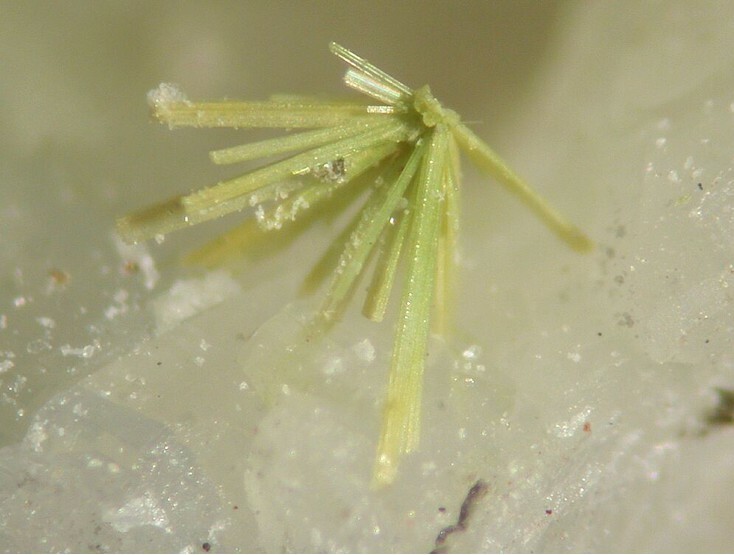 Most green coatings on millerite are probably hydrohonessite; honessite appears to be rarer, and hydrates readily to hydrohonessite". Redefined BY IMA 2014 as a valid species (IMA 14-E). Millerite 14 photos of Jamborite associated with Millerite on mindat.org. Quartz 7 photos of Jamborite associated with Quartz on mindat.org. Dolomite 5 photos of Jamborite associated with Dolomite on mindat.org. Calcite 3 photos of Jamborite associated with Calcite on mindat.org. Sphalerite 2 photos of Jamborite associated with Sphalerite on mindat.org. Baryte 2 photos of Jamborite associated with Baryte on mindat.org. Galena 1 photo of Jamborite associated with Galena on mindat.org. Chalcopyrite 1 photo of Jamborite associated with Chalcopyrite on mindat.org. Vaesite 1 photo of Jamborite associated with Vaesite on mindat.org. MORANDI, N. & DALRIO, G. (1973): Jamborite, a new nickel hydroxide mineral from the northern Apennines, Italy. American Mineralogist 58, 835-839. Morandi, N., Dalrio, G. (1973) Jamborite: A new nickel hydroxide mineral from the Northern Apennines, Italy, American Mineralogist, 58, 835-839; De Michele, V. (1974) Guida mineralogica d'Italia. Istituto Geografico De Agostini, Novara, 2 vol., 408 pp. ; Dalrio, G. (1980) Mineralogia del bolognese. Officine Grafiche Cacciari, Bologna, 120 pp. ; Pedroni, G., Rosciglione, L., Varoli, M., Baratta, C. (1996) I minerali delle ofioliti nell'Appennino bolognese e modenese. Gruppo A.V.I.S. Mineralogia e Speleologia, Bologna, 286 pp. Pedroni, G., Rosciglione, L., Varoli, M., Baratta, C. (1996) I minerali delle ofioliti nell'Appennino bolognese e modenese. Gruppo A.V.I.S. Mineralogia e Speleologia, Bologna, 286 pp. Personally collected from the founder of the mineralized zone; Pedroni, G., Rosciglione, L., Varoli, M., Baratta, C. (1996) I minerali delle ofioliti nell'Appennino bolognese e modenese. Gruppo A.V.I.S. Mineralogia e Speleologia, Bologna, 286 pp. Bindi L., Christy A.G., Mills S.J., Ciriotti M.E., Bittarello E. (2015) New compositional and structural data validate the status of jamborite. Canadian Mineralogist, 53, 791-802. Esposito M., Odicino G. (2012): Storia di un'idrotermalite a Marsaglia in Val Trebbia. Prie, 8, 2, 41-45. Bonechi M., 1994. La cava di Meleto ed i suoi minerali. Riv. Min. Ital., 17: 123-130. · Orlandi P., (2005): "Geositi minerari e mineralogici della provincia di Pisa" in La geologia della provincia di Pisa. Cartografia, geositi e banche dati, pp. 55-280, Provincia di Pisa, 2005. · Betti, C., Bazzoni, C., Bernocchi, M., Pagani, G., Ciriotti, M.E., Bittarello, E., Batoni, M., Batacchi, C. (2017): Poggio del Cornocchio e dintorni (Firenze - Pisa - Siena): storia, miniere e minerali di una zona poco conosciuta. Micro, 15, 1, 2-43. Calvo, M. (2008). Minerales de Aragón. Prames, Zaragoza. 463 pags.